There have been three single family homes sold so far, all in Cocoa Beach. They ranged from a small, trashed 3/2 short sale on Samar that sold for $110,000 to a direct river 4/2 on Bali that closed for $389,000. Checking the MLS this morning I find a total of 131 pending or contingent residential properties in the two cities. Over half of these contracts are short sales. Of 716 total active residential listings, only 94 are short sales. This skew between offered and contracted numbers makes it clear that the action in MLS-listed properties is heavily concentrated in the distressed properties. If you're hoping to take advantage of the market, don't make the mistake of only looking at distressed properties. There are a few sellers who understand the market dynamics who have priced their properties accordingly without the hassles of the short sale process. On the other hand, if you have a good property contracted as a short sale at a good price and are losing patience because of the length and opacity of the process, be strong. Unless you find something better in the meantime, your patience may be eventually rewarded with approval. We have had a flood of short sale approvals recently after months of very little contact from the lenders, so, be aware of the frustration of the process, be patient and have a Plan B in case you don't get approved. Snook are still being caught in the surf and the mullet run hasn't really peaked yet, so, there's plenty of opportunity for everyone to get out there on the beach and catch a great dinner. 1. Assuming no dishonesty, is it ethical for a listing agent to use all of her skills, experience and knowledge to try to get her clients the highest possible price at the best possible terms? Is the answer the same if this behavior contributes to rising prices, harming future buyers? 2. Conversely, also assuming no dishonesty, is it ethical for a buyer's agent to use every bit of his skills, experience and knowledge to obtain the lowest possible price at the best possible terms for his client? Is the answer the same if this behavior contributes to declining prices, harming future sellers? I ask these questions for a reason. I represent a lot of buyers. In my representation I always use every scrap of market knowledge and all my negotiating skills to try to do the best possible job for my clients which usually means the lowest possible price at the best possible terms. I do this with honesty and fairness to both sides of the transaction. My efforts in recent years have often been a part of the chain of lower and lower selling prices in many complexes and neighborhoods. It was reported to me this past week that my aggressive representation of my clients, buyers all, was being characterized by at least one Cocoa Beach citizen as unethical because it has contributed to lower prices in our market. While the premise seems preposterous, at least to me, I welcome comments here on this blog from anyone who has some insight to share. I certainly know that I tend towards the aggressive in my negotiating but I feel strongly about my character and ethical standards and, in this case, take offense to the accusation. I will take all comments with an open mind. Thanks for reading. Back to our regularly scheduled programming with the next post. Sorry for the break in posts. I avoided the Labor Day crowd in the mountains of North Carolina. The numbers are in for August. As you can see from the graph above, we have taken the first step off the seasonal sales cliff. 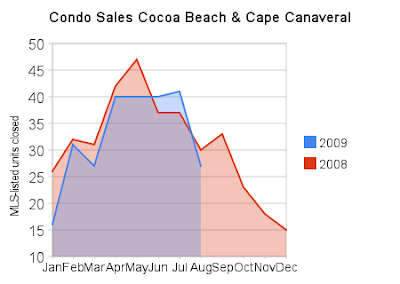 After trending above last year's numbers in June and July we had a total of 27 closed MLS-listed condos and townhomes in Cocoa Beach and Cape Canaveral in the month of August, slightly behind last year's 30 units closed. The sales ranged from $37,000 for a tiny Lamp Post efficiency in Cape Canaveral to $2.01 million for the entire top floor of Ocean Cove in south Cocoa Beach. This particular brand new unit was 6000 square feet with 4+ garage spaces and a private boat slip across the street on the Banana River. Shortly after this sale closed, the developer slashed over a million dollars off the prices of the remaining unsold units in the building. Sales of note included a Meridian resale that went for $575,000, over a hundred thousand less than the new purchase price just two years ago. In south Cocoa Beach a fifth floor Crescent Beach Club south corner unit closed for $425,000. It was a three bedroom unit with 2278 square feet. Next door at the Constellation a 6th floor unit with 2419 square feet sold for $395,000 and a 5th floor south corner beautifully totally remodeled unit at Coral Sands went for $405,000. A foreclosed Perlas del Mar in Cape Canaveral sold for $165,000, a remarkable $285,000 less than the new purchase price two years ago. A 2/2 townhome at Villages of Seaport closed for $107,000 as a short sale. There were only four closed single-family home sales in the month, none for more than $200,000 and none on the water. For those looking for direct ocean units in the lower price range, I can find 29 units this morning with at least two bedrooms asking under $300,000 that are east facing. Over-priced listings still dominate the declining inventory but gems are there for the patient. If you'd like a daily dose of new listings, price drops, sales and market news of note you can follow my Twitter feed. In case you missed it, snook season has opened and the fish are already on the beach feeding on the early schools of mullet making their annual run southward. Use a cast net to catch mullet from the beach, put one back out with a weight to keep it on the bottom and hang on for some of the best eating in the ocean. Comments are welcomed on any of the posts here.